Unfortunately, there is not a lot of written evidence about the true beginnings of this culinary creation, but there are plenty of legends that surround its origins. Even the city’s most notable historians have only been able to piece together guesses about who really invented this style of pizza. There is enough evidence to prove that Richard Novaretti, who went by Ric Riccardo, and Ike Dewell were the first to open a restaurant specializing in deep-dish pizza . Sewell originally suggested that the pair open a Mexican restaurant, but Riccardo got very sick after trying out some sample menu items. He decided to compromise with Sewell by suggesting that they instead open a pizza place. Sewell thought they should maximize the ingredients to create a bigger, better pizza than anyone in the area had sold before. In 1943, The Pizzeria officially opened its doors, but quickly changed its name to Pizzeria Ricardo. By 1955, the restaurant became Pizzeria Uno, and this name is still in use today. Riccardo and Sewell opened up another restaurant called Pizzeria Due shortly after. Whether or not these two invented the deep-dish style pizza or just marketed it better than anyone else, they are an integral aspect of how it became a popular dish in Chicago and beyond. 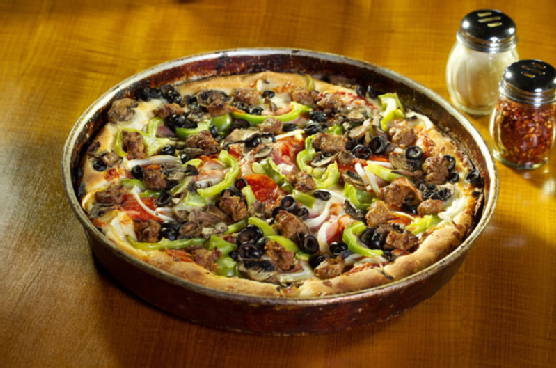 With locations in Palo Alto and San Jose, Pizz’a Chicago makes it easy to get your deep-dish fix in California. Our menu has plenty of delicious pizza combinations to keep you coming back for more. We also offer corporate catering. To learn more about our menu or locations, call (408) 283-9400 or (650 424-9400.